When Ducks Unlimited’s Chris Jennings invited me to northern Arkansas for a “light” goose hunt, I wasn’t quite sure what I should expect. But Chris and I had been friends for years and, from what I could gather in our conversation, we could expect to take hundreds of geese each day and would perhaps see tens of thousands. Wait a minute, I thought. The days of taking hundreds of waterfowl ended with the last of the market hunting in the early 1900s, and I thought Chris must have misspoken. But I did a little research and came to realize just why DU was so interested in these hunts. In the 1980s, researchers announced that snow goose levels were too high; the tundra habitat in which they lived had a carrying capacity of about 800,000 to 1.2 million birds, and by the early 80s, snow geese numbers were already at 1.7 million. That doesn’t include Ross’s and blue geese, which round out the trio of birds known as “light” geese. By the mid-90s there were an astounding 2.7 million snow geese and numbers were increasing, and the tundra habitat couldn’t sustain that. The overpopulation of geese was beginning to erode the tundra’s ecosystem, reducing plant matter and increasing salinity, which caused problems for a myriad of other species including other waterfowl. The light geese had to go, and hunting was the best option. I sat in the blind in Arkansas watching a spectacle I’d never imagined; the February evening sky was blackened with geese as far as I could see, and their chortling call was all that could be heard across the open prairie. Did North America have a light goose problem? Based on what I saw, I would certainly say yes. 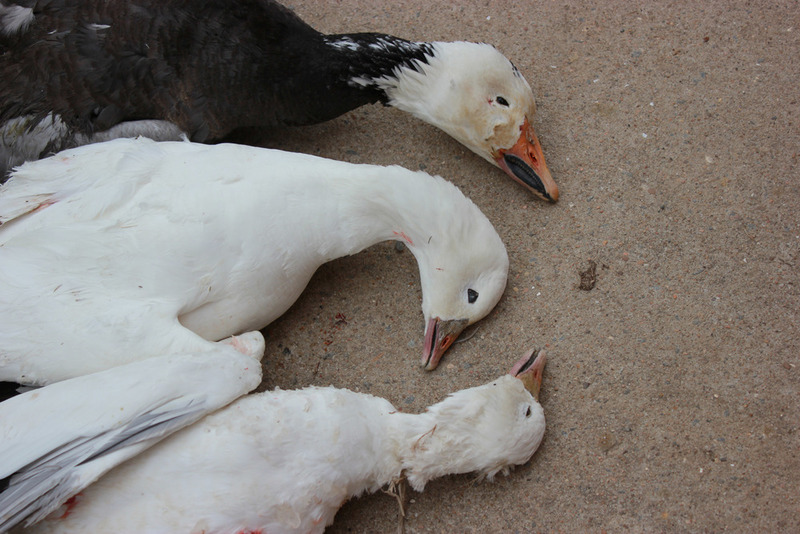 States like Arkansas and Missouri have loosened relatively strict waterfowl hunting laws when it comes to light geese; in many cases you can use extended magazine tubes, electronic callers and bag limits are high. In addition, the extended seasons that coincide with migratory patterns of these geese offer great hunting in February and March, when many other species are closed to hunting. This gives you a few extra weeks or even a month of waterfowl season, and by reducing goose populations you’re helping preserve the tundra habitat that is slowly falling victim to these birds. In addition to tundra preservation, light geese are also excellent table fare. When properly prepared, these birds provide excellent dining, and on a good day you’ll harvest enough geese to occupy a significant portion of your deep freeze. In one shooting session you may take more shots at birds than you will in years of Canada and speckled goose hunting, helping improve your shooting skills. Fair warning, though—light geese like a lot of decoys, so spreads should have decoys numbering in the hundreds, but the good news is these birds respond well to flag decoys so you won’t have to invest in that many shells. And if a group of birds start circling down toward you in the famed “tornado” pattern you’ll be so overwhelmed by sheer goose numbers that it is hard to pick one bird to shoot. Hunting is one of the most successful forms of conservation, and in the case of light geese hunting is an essential form of population control. When you head out during late winter and early spring this year, you’ll not only be adding to your season and filling your freezer, you’ll be doing your part to help save some of North America’s most important wildlife habitat.